Two photographs from the Powerpoint (monthly Christian youth event) band rehearsal this evening that I’ve ‘stitched’ together using the wonders of Paint Shop Pro X. 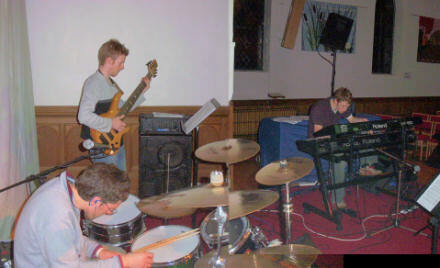 Why are Andrew (drums) and Tim (keyboards) both hunched over so?! 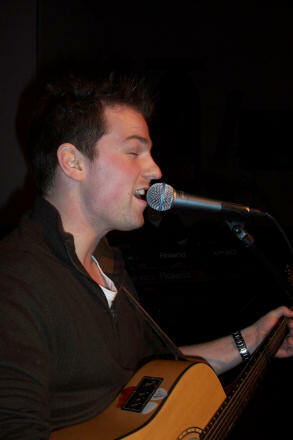 Here’s an action shot of Neil (acoustic guitar and vocals). He looks nothing like a folk singer, I don’t know what you mean! The rehearsal went really well, with some quality prayer time before hand. I’m back on my Burns Brian May guitar through the Vox VBM1 treble-booster and Digitech GNX2; the last few months I’ve been playing my FenderÂ® StratocasterÂ® (though mine is a Mexican Strat rather than American). I’m looking forward to the Powerpoint tomorrow evening. A time to worship God through playing guitar and singing. I’m going to change my name to Finbar and growing a big grey beard. Looking forward to tonight, let’s pray the sound is comparable with last night! I used to get called Finbar by a friend of mine, Richard, (who is now a Roman Catholic monk) at St Andrews (the University of Scotland) because of the Viz character ‘Finbar Saunders and his double-entendres’. Beard sounds good — beards are great. 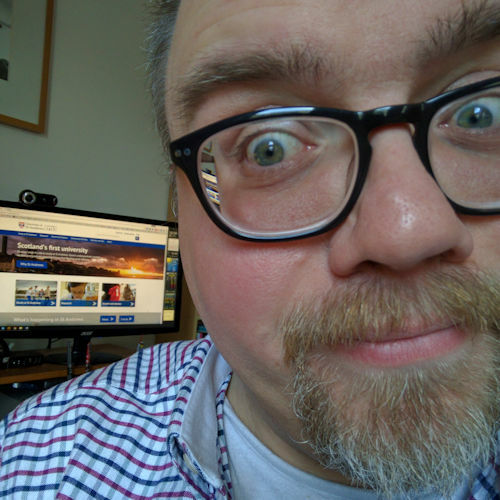 Previous Previous post: What about a Church blog?